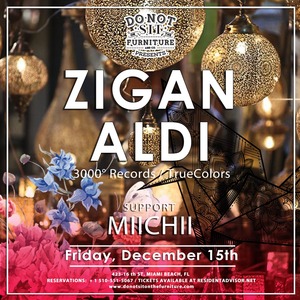 Friday, December 15th, Do Not Sit On The Furniture presents Zigan Aldi [3000 Records / True Colors] Support by: MIICHII Zigan Aldi ... How does it sound like when heaven and earth become one in the golden light of the morning? If you wanna find out, have a listen to Zigan Aldi. He delivers dance tracks of truly epic dimensions. According to an old legend, Nemrut was a king who made peace between heaven and earth. That’s why a mountain in Turkey is named after him. The music is like the soundtrack for a climb up that mountain: It’s a steady rise, opening ever new perspectives on the surrounding soundscape, while at the same time the listener is overcome by an ever growing feeling of harmony.